New Jersey may be one of the smallest states, and tucked in the shadow of New York City, but it punches above its weight with a stunning coastline, whip-smart Princeton, some of the finest views of Manhattan and peaceful rural towns. 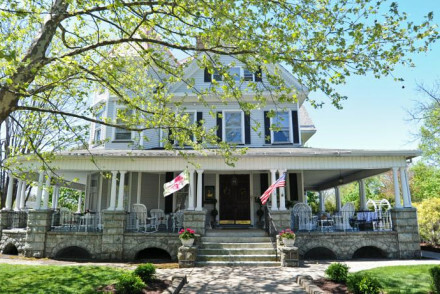 This unexpected variety makes it a tough choice when looking for the best places to stay in New Jersey. In the summer all of New Jersey, it seems, heads to the Atlantic coast. But with 127 miles of beautiful beaches, there’s room for everyone. In the north, Sandy Hook has lovely white dunes where you can sunbathe to a backdrop of the Manhattan skyline. In the Gateway National Recreation Area, you’ll find the nation’s oldest lighthouse, birdwatching and fishing. For a change of scene, you can hop on a ferry and in 45 minutes be in Lower Manhattan. If you're looking for a bit more peace and quiet, then Ocean Grove or Spring Lake will be just the ticket, where the pace seems steeped in genteel Victoriana. Down on the state’s southern tip, Cape May is the country’s oldest seaside resort and one of the few places where you can see both a sunrise and sunset over the sea. The 190-acre Cape May Point State Park is home to Cape May Lighthouse, built in 1859, whose light can be seen from 25 miles away. In summer, climb its 199 stairs and see how far you can see. Princeton is a tiny town with a top-tier, Ivy League university. Take a tour of its 18th-century buildings, including its art museum. For wilder walks and hikes head to Pinelands National Reserve, inland from Atlantic City, a vast area of desolate sandy-soil forest, cedar bogs and wild blueberries, where you might spot rare orchids. For amusement parks and casinos stay in Atlantic City where the boardwalk - the world’s first, built in 1870 - runs along eight miles of beach. Prefer a bit of kitsch? Explore the three Wildwood towns which seem preserved in a gloriously tacky neon 1950s. There’s even a museum, the Doo Wap Experience, devoted to neon signs. Don’t be put off; the beaches are some of the coast’s largest. If you’re planning to visit the coast in the summer, be aware that many locals will be too, so the best places to stay in New Jersey can get booked up pretty quickly. It may be a B&B but The Wooden Duck Inn, near Newton, is hotel-stylish with large, contemporary-country rooms - some with private terraces or four-poster beds - and a beautiful outdoor pool. Surrounded by woodland, it’s blissfully quiet, and there’s a ‘snack station’ for those hungry moments during the night. The nine rooms in the charming white clapboard Whistling Swan Inn are furnished in elegant, traditional style with antiques, toile du jouy fabrics and the softest of colours. Choose the turret room for ultimate romance. There are lots of personal touches that make this a home-from-home in the quaint town of Stanhope. The Asbury, located just a short distance from Ashbury Park's boardwalk, offers simple yet smart accommodation and large common areas - complete with table tennis and pool tables. Come back after a day out to relax in the rooftop bar and admire the stunning views. 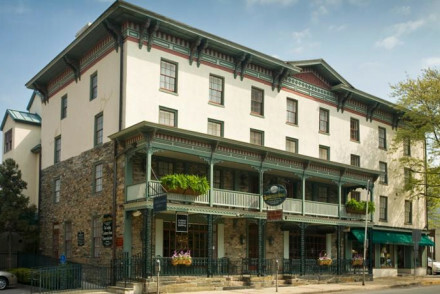 Rooms are cosy and country-house traditional at the Lambertville House Hotel, close to the Delaware River. Some rooms have a balcony and there’s a charming flower-filled courtyard for dining al fresco. If you've decided that you'd prefer the privacy of a self-catering option then browse through the wide range available online with our partner, Booking.com. Best time to visit New Jersey is during the summer months, with the average temperature rising to 30°C in July. Expect the place to be fairly packed at this time - especially the beaches! For a quieter and cheaper stay, consider visiting in May, September or October. Fly into Newark Liberty International Airport, which is well-served by public transport links to take you elsewhere in the state. United, Virgin Atlantic and British Airways fly direct from Heathrow - with the journey lasting around 8hrs30. Browse our list of the best places to stay in New Jersey. Expand your search to include neighbouring New York State. 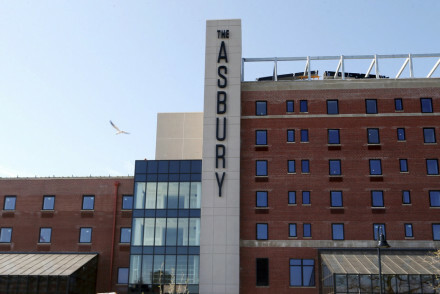 The Asbury is a contemporary hotel located 300 metres from the city's boardwalk. It offers chic and simplistic accommodation, spacious common areas with table tennis and a pool table, and an outdoor pool. Enjoy a drink at sunset at The Baronet bar's rooftop garden! A friendly and unique city spot. Victorian style town house in quaint Stanhope. Each of the nine rooms has been carefully decorated in floral patterns, soothing colours, soft and luxurious fabrics and antique but well-maintained furnishings. Mouth-watering country buffet breakfast, free bikes to borrow and fresh home-made cookies. Restrictions on children - Children older than 10 years are welcome. 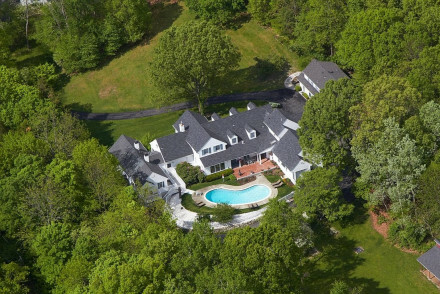 Secluded and cosy country bed-and-breakfast inn with outdoor pool. Each room is distinct, with fireplaces, balconies and four-poster beds each in select rooms and an overarching theme of rustic, traditional country chic. Indulge yourself every morning on a mouth-watering three-course breakfast. Views - Enjoy gorgeous views any time of year, filled with wooded acres, rolling hills and wildlife throughout. Four poster beds - The Mallard and Pintail rooms have four-poster beds. Great walks - Give the Sussex Rail Trail a shot! Sophisticated inn near the Delaware River. Interiors are well-appointed with classic design. Bar offers Martini menu, selection of wines and small plates. Restaurant serves delicious and flavourful fare by Dish Catering. Eat outside in the courtyard garden with flowers creeping up the trellises. Sights nearby - The James A. Michener Art Museum and Mercer Museum are a 22 minute drive from the hotel.